RAW rolling papers are made of an unbleached (chlorine free) fiber blend that lends to clean tasting smoke. Your natural choice for rolling paper, you can see through the natural light brown hue of the rolling paper. RAW rolling papers was made out of a desire to make an additive free rolling paper. RAW rolling papers are 100% vegan. These rolling papers are flat and unfolded. 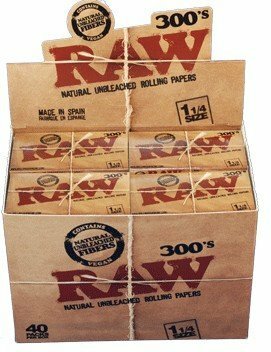 RAW 300's come with 40 packs per box, and 300 leaves per pack. This means you get 12,000 natural rolling papers. This means you can enjoy smoking tobacco without the need to restock your rolling papers often. This leaves you more time for you to enjoy what you love doing, smoking.